Here because you deal with Landscape Drainage issues? Isn’t rain wonderful! 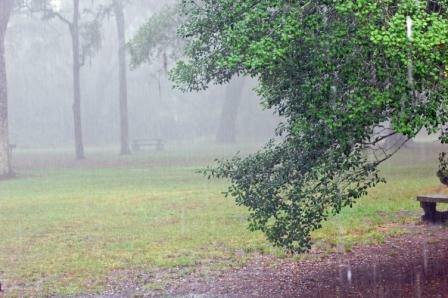 It brings life to the earth, and green to our yards…as long as the rain doesn’t decide to move in! 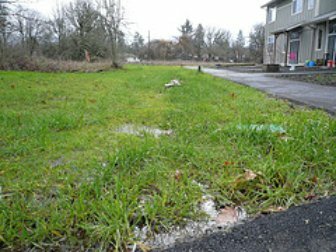 Some residential properties are plagued with drainage issues, which can be a real problem if you are the perplexed owner of said properties. If your garden is one of those, it is likely to be painfully obvious! You will have webbed feet, because you will always be sloshing through puddles and changing shoes! Most smaller gardens do not need a full drainage system installed, however. There are simple solutions which can be implemented, from installing drains to installing dry beds. Some are as simple as fixing the gutters. 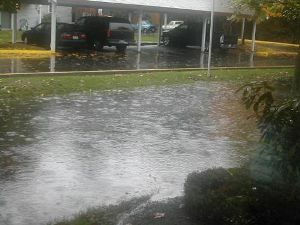 Most of your landscape drainage issues do not need to be contracted out. By far the largest percentage of garden drainage issues are smaller scale and affect smaller areas that have water standing after a heavy rain. A much smaller percentage have the opposite problem, when water runs so quickly through the soil that plants have no opportunity to get their daily drink of water. These problems need to be fixed before installing your new garden design. Woe to the eager gardener who plants expensive plantings without understanding the drainage issues they might face! 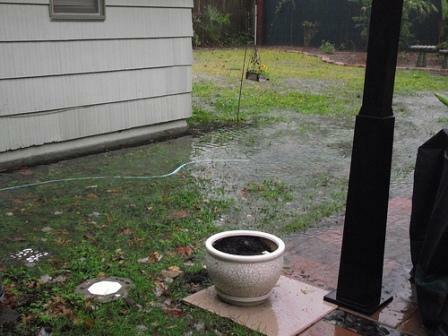 Most of the time when you have water drainage issues in your yard, you will find out very quickly after a heavy rain. You will have standing water, muddy pools, new rivers, or splashing water at the downspouts of your home. You may not, however, be able to determine quite as easily if your soil is very sandy and therefore allows water to drain through very quickly, or if your water table is high and water is not visible on the surfaces. To identify water drainage issues, it is best to go out either just after or during a heavy rain, and perform a few simple tests and make observations. You may feel like a drowned rat when you come in, but you will be saving the lives of your expensive and choice plants in the near future. It’s worth it! When you are wandering your garden in your bright yellow slicker, look for some of the following signs of drainage issues. Water overflowing the gutters and pooling near the foundation of your home. Water pooling at the end of the downspouts at the corners of your home. Water pooling in the yard, under decks, or in the garden areas. Rivulets of water running through the garden and lawn areas uninvited. Areas of soil that seem to have fissures developing, and soil that appears to be eroding away. This may mean water running underground. Note the areas where these things are occurring for later use. Now you go dry off that wet hair! Take a warm bath and go read a book on landscape drainage problems! There are a few more things that can be done to determine if you have other drainage issues that are not as apparent. But you don’t have to do them in the rain! To improve a drainage problem, you will first have to discover its source. There are basically five common causes that create drainage problems. The following links can help you identify what sort of problem you are experiencing, with a few ideas about what to look for in regard to solutions. Check them out! Once you know what type of garden drainage problem you have, you are ready to start pursuing some solutions!